Let's start by addressing the big news of the day. Many of us have been holding our breath regarding the Collin Sexton situation, and unfortunately our fears came to fruition a few hours before tip-off when it was announced that he would not play due to eligibility concerns. Ever since the FBI investigation story broke which led to Kobie Baker's dismissal, we've heard the staff was optimistic that Sexton would be able to play. However, those statements always came with qualifiers such as "as of right now," or "based on what we know" or "unless something else comes up." It's true, there's nothing definitive in the FBI report that would indicate Collin either actually signed with an agent or accepted improper benefits. Nevertheless, one would have to be pretty naive to believe that Kobie kept all of that money himself and none of it funneled down to Sexton or someone close to him. When asked about the situation more recently Coach Johnson issued vague statements of "we're going forward with our roster." He also said after the game last night that "new information surfaced not within the last 24 hrs but the last 8 hours." The University released a statement saying that "The NCAA informed us late this afternoon that Collin Sexton has not had his eligibility reinstated by the NCAA. We don’t have any further information at this time, but we will continue to cooperate with the NCAA and work toward a resolution that results in Collin’s timely reinstatement." That's all we know at this point, but here's my pure speculation on what is going on. After conducting our internal review, we declared him ineligible and presented our findings to the NCAA and basically said, "look, we fired Kobie, we've talked to the player and his family, we don't think he's done anything to violate the amateurism rules but out of an abundance of caution we've declared him ineligible. Please reinstate him before our upcoming game." This is a fairly common procedure that schools do as a CYA, so if something comes out later they have the defense of, "we told you about this up front and you cleared it." We were hoping/expecting he would be cleared, but the NCAA probably said, "no, we want to look into this more." They probably want to interview people involved. Hopefully they don't ask the FBI to subpoena bank records and what-not. The other concern is Kobie really does not have a reason to protect us or Collin at this point. Regardless, it was the right decision not to push the envelope on this one. I would not be any more surprised if he's reinstated this week for the Memphis game than I would be if he never sets foot on the court in a meaningful game for us. At this point, we will just have to wait and see. For whatever it's worth, his body language on the bench was generally upbeat and positive. He was encouraging and supportive of his teammates, and certainly did not look like somebody who isn't expecting to be playing for this team. With that out of the way, let's move on to the game. As if the Sexton situation wasn't bad enough, we were also without the services of Braxton Key, Armond Davis, and Riley Norris. Unfortunately, all will be out for a while. Braxton Key underwent surgery for a torn meniscus today. He will likely be out 4-6 weeks. Riley Norris is dealing with groin and hip injuries, and will probably miss at least 2 more weeks. Davis has a knee injury and has already been out a substantial amount of time and does not appear to be close to returning any time soon. I posted a few weeks ago that I was hopeful that for once we would be going into the season with a good idea of our starting lineup and rotations. Instead, we took the court last night without 25% of our scholarship players and missing 40% of our expected starting lineup, so it was back to the drawing board. The starting lineup was 1.AJ 2. Petty 3. Herb 4. Dazon 5. Hall. We tried to play at a quicker pace but had problems with turnovers and simply not finishing good opportunities. Lennie Acuff is a great coach and had a good plan. In the first half, we simply could not stop Justin Ward, a 6'6 220 lb red shirt sophomore who plays every position for them including point guard. When we put a big on him, he would move away from the basket and create space. When we put a guard on him, he took it to the lane and scored or got fouled. The Chargers jumped out to a 14-1 lead in the first 5 minutes and led throughout most of the first half. We answered with a nice run to take a 19-18 lead, but UAH led by 2 at the half. We made some nice adjustments in the second half. Herb Jones drew the primary responsibility for defending Justin Ward, and after he scored 24 in the first half, he was held to only 5 in the second. Herb had a very good game overall, his defense was outstanding and he made a few plays on the offensive end. He ended with 14 points but he also had 4 turnovers, primarily from telegraphing his passes. I think this will improve as he becomes more comfortable playing with his teammates at this level. We also made an effort to drive in against Ward, sending him to the bench with his 4th foul about midway through the second half. At this point, Daniel Giddens took over in the paint. The shots were not falling for us offensively, we were only 3 of 21 from 3 point range, but UAH simply did not have the size or depth to keep us from scoring at will in the post. Giddens took over the game in the second half and ended up with a double-double 17 points and 10 rebounds. My only complaint with the bigs in this game was their free throw shooting. We were 13-25 as a team, Hall was 3 for 7, Giddens was 1 for 4, and Galin was 0 for 3. Galin did give us 5 rebounds in only 11 minutes of playing time. Petty was only 2 for 7 from three point range and had 5 turnovers, but still managed to grind out a decent game by disrupting the Charger offense and scoring 14 points to go along with 5 steals. While we all enjoyed a good laugh at auburn losing to Barry, and would have been embarrassed to drop this one, I think it's easy to read a little too much into these exhibition games. It's clear that we were trying to let everyone play and experimenting with some different combinations. I don't think Lawson gets 6 minutes of playing time in a close game that counts on the record. At the same time, the opponent is playing like it's game 7 of the NBA finals. UAH is a solid program and they took us to overtime a couple of years ago. The fact that we were able to eventually put this game away under the circumstances speaks to our depth. 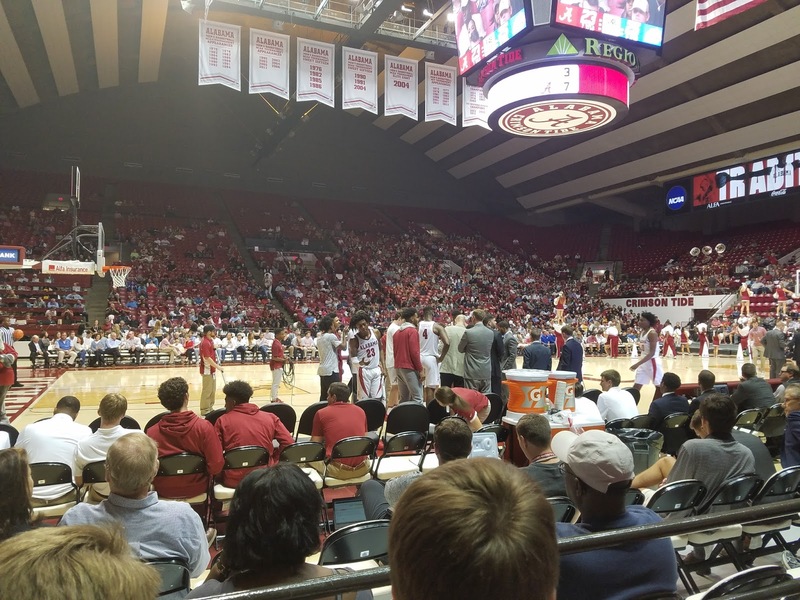 It was a decent crowd for a Monday night exhibition game. I would guess a little over 4,000. The Chargers brought a couple hundred or so fans from the Rocket City, including about 20 cheerleaders and dance team members for some reason. It was also good to see several football players there supporting the basketball team. Mack Wilson was sitting near us, on crutches. One minor complaint, whoever is running the stat boards needs to pay a bit closer attention. There were times when they had wrong lineups on the boards, and the ribbon board showed UAH as "20 for 20" on free throws all night. Up next, we are playing for keeps against Tubby Smith's Memphis Tigers in the Veteran's Day Classic Friday evening at the Naval Academy in Annapolis, MD. The game will tip off at 6:30 EST, 5:30 Central, and will be televised on CBS Sports.